The NC Institute for Constitutional Law (NCICL) recently published an article about nullification, asserting that it not a legitimate constitutional remedy. In a state where support is growing for nullification, it was quite disheartening to read the intellectually-deficient position the NCICL took on this basic constitutional remedy articulated by our greatest Founding Father, Thomas Jefferson. In this paper, I will examine the arguments in that article and explain why, in fact, nullification is more legitimate than ever. Before discussing nullification, let’s first get to know this great man, Thomas Jefferson, who contributed so much to our great American experiment. He authored the Declaration of Independence, is the father of our religious liberty, and to a great extent, provided the blueprint for our Bill of Rights. He gave us a unique system of government centered on the inalienable rights of the individual and not the divine right of kings. The power of government would derive from the people, who were sovereign over their humanity. As sovereigns, individuals would have the right to alter or abolish governments that were destructive of their rights. Never before had a nation placed such importance on the People, as individuals and not in the collective. In the early days of the republic, he fought for the strict interpretation of the Constitution against the Federalists (the party of Alexander Hamilton and his supporters) who sought to broaden the scope of Congress’ powers by claiming implied powers. Jefferson is widely considered the most brilliant and well-read of our Founders. And for all his contributions to the design of our government, we often say that it is based on Jeffersonian principles. Jefferson emphasized the need for a republican form of government. He believed it was the only form of government not at war with the fundamental rights of mankind. He summed up the design of an effective, “safe” republican form of government this way: “The way to have good and safe government, is not to trust it all to one, but to divide it among the many, distributing to everyone exactly the function he is competent to. Let the National Government be entrusted with the defense of the nation and its foreign and federal relations; the State governments with the civil rights, laws, police, and administration of what concerns the State generally; the counties with the local concerns of the counties, and each ward direct the interests within itself. It is by dividing and subdividing these republics from the great national one down through all its subordinations, until it ends in the administration of every man’s farm by himself; by placing under everyone what his own eye may superintend, that all will be done for the best.” (letter from Thomas Jefferson to Joseph C. Cabell, 1816). Compare what Jefferson wrote in that letter to Joseph Cabell to the explanation James Madison provided in Federalist No 45 as to the federal nature of our government. In his description of a “good and safe government,” Jefferson seemed to affirm the brilliance of the federal system that our founders designed for us in 1787. The task for our Founders in Philadelphia in 1787, of course, was to design an effective government to serve the interests of the several states and bind them in a Union based upon common goals yet honor the charter of freedom that Jefferson wrote to define the character of our nation. Once the delegates decided on the nature of the government – a federal government of limited powers – the next step was to determine how to keep the government limited to its expressly-enumerated powers, and how to prevent it from encroaching on the rights of the States and the Individual. The primary political philosopher of the Constitution, James Madison, brilliantly sought to address this problem by dispersing government power among many power centers. He understood that the separation of powers was essential to prevent the consolidation of government and the formation of centralized, authoritarian tyranny to which all governments are prone. In those early days, the greatest concentration was in the state governments, themselves divided into separate branches. At the federal level (or as Madison called it, the “general government”), power was divided into the House of Representatives, the Senate, and the president. If any one of the power centers tried to invade the domain of the others or more dangerously, to expand its power outside the bounds of the Constitution, the other power centers, always mindful of the precarious balance, would be highly motivated to mobilize and thwart those ambitions. With the inherent power drive of each center checked by the others, the citizens could maintain their own freedom from the travails of overweening government power. Yet another check the Founders gave us on government power was the Supreme Court, which was vested with the duty of interpreting the Constitution and laws and “rendering an opinion” as to the constitutionality of the laws or power grab from any of the other branches. The power to actually strike down laws it deems unconstitutional was actually granted to the Supreme Court by itself in the early case of Marbury v. Madison (1803). If we’ve learned anything from the recent John Roberts/Supreme Court decision to uphold Obamacare’s Individual Mandate as constitutional, it is that constitutionalists cannot rely on any branch of the federal government to curb the steady rise of federal government power that has taken place over the last hundred years. James Madison, considered the Father of the Constitution, agreed with a strict construction approach. His advice was this: “Do not separate text from historical background. If you do, you will have perverted and subverted the Constitution, which can only end in a distorted, bastardized form of illegitimate government.” Both Jefferson and Madison believed that strict limits on federal power were essential for liberty. The reason for nullification is to further the very goal that our Founders addressed in the design of government – to prevent liberty from yielding and government from gaining ground. Nullification is necessary to maintain the precarious balance of sovereignty enshrined by our Constitution and also by the Ninth and Tenth Amendments. It is necessary to prevent the government from the natural tendency to concentrate more power in itself. Jefferson asked what the appropriate remedy would be when the government attempted to abuse its powers. He recognized three options: judicial review, secession, and nullification. The first, he felt, was untrustworthy and the second, he felt was too extreme. Nullification was the sensible, constitutional, level-headed approach. 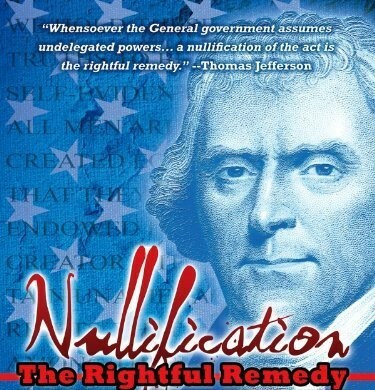 In the Kentucky Resolves of 1798, Jefferson wrote: “The several states who formed that instrument, being sovereign and independent, have the unquestionable right to judge of its infraction; and that a NULLIFICATION, by those sovereignties, of all unauthorized acts done under color of that instrument, is the RIGHTFUL REMEDY.” Nullification enables abuses of the Constitution to be nipped in the bud, thereby preventing any escalation of frustration which might lead to something extreme – such as secession. Unfortunately, it wasn’t long after the US Constitution was ratified and the Union was formed that Congress began testing the limits of its power. The first major constitutional question that came up concerned the creation of a (national) Bank of the United States. Jefferson was Secretary of State at the time and President Washington asked for the opinions of his heads of departments. He wrote Washington that ours is a government of delegated powers. “The incorporation of a bank,” he said, “and the powers assumed by this bill, have not, in my opinion, been delegated to the United States by the Constitution.” He went on to explain each of the enumerated powers, explained why the power to incorporate/charter a bank was not delegated, and finally recommend that the bill be vetoed. Washington would eventually side with Hamilton. The Aliens & Sedition Acts immediately sent up constitutional red flags to many of our Founders, although it appeared to be partisan in nature. Congress, dominated by Federalists, pointed to the “General Welfare” Clause, the “Necessary and Proper” Clause, and its war powers for justification to pass these pieces of legislation. The President at the time, John Adams, was a Federalist, and he believed the Constitution could be liberally-interpreted so as to permit these regulations. The Vice President, Thomas Jefferson, on the other hand, a Democrat-Republican, subscribed to a strict interpretation approach. It was his opinion that the Naturalization Act exercised a power nowhere found in the Constitution and the Sedition Act violated the protections of free speech in the First Amendment. James Madison shared in his opinion. Confronted with an obvious trend – the self-serving liberal interpretation of the Constitution and concentration of power in the federal government, despite the intentions to establish a government of limited powers – Thomas Jefferson took the opportunity presented by the Alien & Sedition Acts to articulate the rightful remedy to push back against such abuses of power. The series of resolutions that Jefferson wrote and shared with Virginia and Kentucky state representatives was adopted as the Kentucky Resolves of 1798. 1. Resolved, that the several States composing the United States of America, are not united on the principle of unlimited submission to their general [federal] government; but that, by a compact under the style and title of a Constitution for the United states, and of amendments thereto, they constituted a general government for specific purposes – delegated to that government certain definite powers, reserving each State to itself, the residuary mass of right to their own self-government; and that whensoever the general government assumes undelegated powers, its acts are unauthoritative, void, and of no force; that to this compact each State acceded as a State, and is an integral part, its co-States forming, as to itself, the other party: that the government created by this compact was not made the exclusive or final judge of the extent of the powers delegated to itself; since that would have made its discretion, and not the Constitution, the measure of its powers; but that, as in all other cases of compact among powers having no common judge, each party has an equal right to judge for itself, as well of infractions as of the mode and measure of redress. That the General Assembly expresses its deep regret that a spirit has been manifested by the federal government to enlarge its powers by forced constructions of the constitutional charter which defines them; and that indications have appeared of a design to expound certain general phrases (which, having been copied from the very limited grant of powers in the former Articles of Confederation, were the less liable to be misconstrued) so as to destroy the meaning and effect of the particular enumeration which necessarily explains, and limits the general phrases; and so as to consolidate the states, by degrees, into one sovereignty, the obvious tendency and inevitable result of which would be, to transform the present republican system of the United states into an absolute, or at best, a mixed monarchy….. In November 1799, the Kentucky legislature approved follow-up resolutions, for the purpose of addressing the comments of those states who had not received Jefferson’s resolutions favorably. It was in the Kentucky Resolutions of 1799 that the word “nullification” was used for the first time in an official document to describe Jefferson’s states’ rights’ remedy. Resolved, That this commonwealth considers the federal Union, upon the terms and for the purposes specified in the late compact, conducive to the liberty and happiness of the several states: That it does now unequivocally declare its attachment to the Union and to that compact, agreeably to its obvious and real intention, and will be among the last to seek its dissolution: That if those who administer the general government be permitted to transgress the limits fixed by the federal compact (ie, the US Constitution), but a total disregard to the special delegations of powers therein contained, an annihilation of the state governments, and the creation, upon their ruins, of a general consolidated government, will be the inevitable consequence: That the principle and construction, contended by the state legislatures, that the general government is the exclusive judge of the extent of the powers delegated to it, stop nothing short of despotism – since the discretion of those who administer the government, and not the Constitution, would be the measure of their powers. That the several states who formed that instrument, being sovereign and independent, have the unquestionable right to judge of its infraction; and that a Nullification, by those sovereignties, of all unauthorized acts done under color of that instrument, is the RIGHTFUL REMEDY: That this commonwealth does, under the most deliberate reconsideration, declare that the said Alien and Sedition laws are, in their opinion, palpable violations of the Constitution; and however cheerfully it may be disposed to surrender its opinion to a majority of its sister states, in matters of ordinary or doubtful policy, yet, in momentous regulations like the present, which so vitally wound the best rights of the citizen, it would consider a silent acquiescence as highly criminal. The essential goal behind nullification is that the federal government cannot be permitted to hold a monopoly on constitutional interpretation. If the federal government were to be permitted the exclusive right to judge the extent of its own powers, warned James Madison and Thomas Jefferson in 1798, it will continue to grow – regardless of elections, the separation of powers, and other much-touted limits on government power. A constitution is, after all, only a piece of paper. It cannot enforce itself. Checks and balances among the executive, legislative, and judicial branches, a prominent feature of the Constitution, provide little guarantee of limited government, since these three federal branches can simply unite against the independence of the states and the reserved rights of the people. Recall how Congress worked with President Obama to push the healthcare reform bill, knowing full well it was an abuse of the Commerce Clause power. [It should be noted that the Supreme Court continued unabated on its course to consolidate great power in the US Congress. Even after Jefferson’s attempts to hold the Supreme Court to a strict construction of the Constitution, in 1819 in the landmark case of McCulloch v. Maryland, 17 U.S. (4 Wheat.) 316 (1819), the Court supported a liberal reading of one of its critical clauses. That case involved a Maryland law that taxed all banks in the state. The government had chartered a National Bank, which had a branch in Baltimore. Maryland taxed the Bank but the government refused to accept the tax, claiming it was exempt and that Maryland was interfering with the legitimate function of the government. Maryland challenged the legitimacy of the Bank claiming that the government had no power to create one. Chief Justice John Marshall held that although none of the enumerated powers of Congress explicitly authorized the incorporation of the National Bank, the “Necessary and Proper” Clause should be read broadly enough to provide the basis for Congress’s action. In that decision, the high Court ignored the meaning and intent of the “Necessary and Proper” Clause as explained by James Madison, the author and drafter of the Constitution and instead chose to accept the view of Alexander Hamilton, who exposed a very broad reading of the clause. Hamilton, a monarchist, was roundly rejected in his political views at the Constitutional Convention because the prevailing view in fact was that of the Federalists who stood for limited powers]. So what did the NC Institute have to say about Nullification? The NCICL then gave a short review of the history of Nullification, claiming it is a “checkered past.” What the NCICL failed to do, however, was to clarify that the “checkered past” is mostly the result of state action cited by history incorrectly as “nullification.” For example, the article notes: “In the mid-1900s segregationists in southern states used nullification to rationalize opposition to desegregation. For instance, in order to prevent federally mandated integration, Arkansas passed an amendment to its state constitution to prohibit desegregation.” Nullification stands for the principle that any law passed without a valid grant of power is null and void from its inception and is therefore unenforceable. A law that is legitimate and pursuant to a legitimate grant of power cannot be subject to nullification. A state or local government that refuses to enforce a valid exercise of legislative power is merely violating federal law. It is not nullifying it. The federal government can theoretically send in Federal Marshals to arrest the governor and the state legislature or local officials, whatever the case may be. It can bring suit in federal court to force it to comply. Desegregation was the federally-mandated remedy in accordance with certain valid decisions by the Supreme Court, such as Brown v. Board of Education. The amendment to the Arkansas state constitution was in violation of the Supremacy Clause. It cannot, in literal terms, be considered a nullification action. Opponents of nullification like to discredit it by associating it with secession. They claim it was used as a prelude to the Civil War. Furthermore, they claim it was used to as the vehicle to intentionally perpetuate slavery. The NCICL hasn’t done this, thank goodness. But many state representatives, in an effort to obscure the real intention behind nullification, have eagerly made that connect. Nullification is the proper remedy to curb the constitutional abuses of the federal government. That is it. Secession is an entirely different remedy, and is often used for different circumstances, such as when the government itself is simply not working out. Nullification, when used properly to fight government tyranny, is an effective means to prevent secession. What do I mean used “properly”? If a state legitimately believes the government has overstepped its bounds under the Constitution and can justify that interpretation in light of the federal compact, then the government itself has the obligation to respect that decision by the state. Government is bound by the Constitution. After all, it is a document used to enforce limits on the government, not people. Furthermore, all officials are bound by oath to support and defend the Constitution. [“I, [name], do solemnly swear that I will support and defend the Constitution of the United States against all enemies, foreign and domestic…”]. The government must respect limits on its power, including when those limits are forced by the states, pursuant to legal and constitutional authority. So the power to prevent secession actually lies within the government’s power and discretion. The NCICL continued to discredit nullification by alleging that James Madison only half-heartedly supported nullification/interposition and in fact, never supported it after 1800. The staff writer noted: “During the Nullification Crisis of the 1820’s and 30’s, John C. Calhoun and other South Carolinians claimed to take up Madison and Jefferson’s mantle as they pushed for nullification of federal tariffs on imported goods. James Madison, who was still living, disputed their claims. Madison intensely criticized and rejected Calhoun’s theory of nullification, saying that allowing a single state to nullify a federal law ‘would ‘altogether distract the Govt. of the Union and speedily put an end to the Union itself.’ According to Madison, it was not the goal of the Resolutions to ‘assert a right in the parties to the Constitution of the United States individually to annul within themselves acts of the Federal Government, or to withdraw from the Union.’” The writer never once entertained the possibility (indeed, likelihood) that Madison didn’t support Calhoun’s use of nullification because he believed the tariff to be a valid exercise of Congress’ constitutional authority. Furthermore, the text of the Virginia Resolutions clearly indicates that each state “has a duty to watch over and oppose every infraction” of the Constitution, and each state is “duty bound” to maintain its constitutional liberties within its “respective” territory. Hence, Madison did indeed contemplate nullification by a single state (rather than by all the states jointly). For many years, the individual states have been timid about asserting their rights under the Tenth Amendment. But that doesn’t mean they can’t exercise the full extent of their sovereignty. It doesn’t mean the Tenth Amendment has been eroded or marginalized in any way. In fact, we are seeing a resurgence in state sovereignty. A number of states have introduced Sovereignty Resolutions in their state legislatures. Some of them have included particular acts of the federal government which would be considered so egregious as to cause a fatal breach of the compact holding the state in the Union. One such act is any attempt on the part of the federal government to re-interpret the Second Amendment to deny individuals the right to own and possess firearms (for self-protection and to protect against government). Likewise, we are seeing a resurgence of the doctrine of nullification among states. You can’t cherry-pick when it comes to the Constitution (although many love to do just that). Either you agree to be bound by the entire document or it means nothing. The same Supremacy Clause that protects the federal government’s authority under the Constitution and all laws and treaties made in furtherance thereof also implies that laws not made in furtherance of the Constitution are not considered ‘supreme law.’ Hence the Supremacy Clause directly supports the very premise of Nullification. The article cites law review articles, the US Constitution, and Supreme Court decisions (Marbury v. Madison and Cooper v. Aaron). It never once addressed the Kentucky Resolutions or the Virginia Resolutions. It never consulted the men who wrote the Constitution or the Federalist Papers in order to find out the intent behind the document, including the Tenth Amendment and even the very Supremacy Clause on which it relies so heavily to repudiate the remedy of Nullification. As I stated at the beginning, I am terribly disappointed in the position that the NC Institute for Constitutional Law decided to take on nullification in their article. Unfortunately, some of our NC state legislators also share a similar position on the subject. But a great many States’ Rights and other constitutional organizations happen to believe as I do – that the NCICL got it completely wrong. They misinterpreted the Constitution, as well relied on misplaced legal authority. I’d like to point out the flaws in the article regarding the constitutional analysis, as I understand them. I’d also like to emphasize that my position is taken from the Founders themselves and in fact, I will state that position using their words and not mine. 1). Where the Authority Comes From. First, the NCICL states that “Nullification holds that a state can invalidate what it believes are unconstitutional federal laws based on states’ rights under the Tenth Amendment to the U.S. Constitution.” Well, that is not entirely correct. Nullification begins with the central premise that a federal law that exceeds the power granted in the Constitution violates the Constitution and is therefore no law at all. It is void and has no effect. It has no force of law. It is unenforceable. That is because it is based on invalid constitutional authority. This is precisely what is enshrined in the Supremacy Clause. That clause states: “This Constitution, and the Laws of the United States which shall be made in pursuance thereof; and all treaties made, or which shall be made, under the authority of the United States, shall be the supreme law of the land; and the judges in every state shall be bound thereby, anything in the Constitution or laws of any state to the contrary notwithstanding.” The Constitution created a government of LIMITED POWERS. Only laws made in pursuance of those limited and defined powers are to be considered “supreme law.” In other words, the Supremacy Clause only applies if the federal government is acting in pursuit of its constitutionally mandated powers. Laws made outside of those powers or in abuse of those powers are not supreme and therefore states are free to regulate. Finally, the legal authority comes from the nature of the Constitution itself, which is a compact (or contract). Since it was the several states which formed that instrument (which thus created the federal government), they best understand the nature and extent of the powers that they agreed to delegate and as Jefferson explained, “they being sovereign and independent, have the unquestionable right to judge of its infraction.” As parties to the federal compact, Jefferson explained that the states must be forever vigilante and must step up, in a constitutional manner, to oppose every attempt, by any branch, to violate that compact. Thomas Jefferson wrote: “Every State has a natural right in cases not within the compact (casus non faederis) to nullify of their own authority all assumptions of power by others within their limits. Without this right, they would be under the dominion, absolute and unlimited, of whosoever might exercise this right of judgment for them.” (draft of the Kentucky Resolves of 1798). Every state at the time of ratification understood that the ratification of the Constitution and their joining the Union was dictated by the law of compact. 2). The Supremacy Clause. The NCICL claims that nullification lacks any basis in the Constitution. The article states: “Nullification not only lacks any basis in the Constitution but also is directly contrary to the most basic principles of federal supremacy and judicial review contained in the Constitution.” It then cites the Supremacy Clause. (U.S. Constitution, Article VI, Clause 2). Despite what position the NCICL might take, the Supremacy Clause of the US Constitution in fact expressly embodies the core principle of nullification. It does so clearly on its face. It has been explained as such by our Founding Fathers and the very framers of our Constitution. The Supremacy Clause does not say and does not mean that ALL laws passed by the Federal Government are the supreme law of the land. It only refers to “This Constitution, and the Laws of the United States which shall be made in pursuance thereof…” Only laws passed pursuant to delegated powers are supreme. Laws passed outside the scope of such powers are null and void and can be disregarded. When you consider and acknowledge what the Constitution stands for, then this becomes as clear as the nose on one’s face. The Constitution is a document that was written and ratified to enforce law on government. It was written to limit the conduct of government to specific grants of responsibility. It is not a carte blanche provision. The undisciplined view that the government is protected in all that it does by the Supremacy Clause is one of the biggest obstacles to nullification. We have to help root out this ignorance. It is a mindset that will help the government on its way to tyranny. States aren’t supposed to be complicit in federal tyranny but rather are supposed to oppose every instance of it. We also must root out the mindset that states have lost their footing vis-a-vis the federal government ever since the surrender was made at Appomattox to end the Civil War, and thus the Supremacy Clause has somehow been indirectly enlarged. Just because a handful of states chose to exert their sovereign right to change their form of government – a right that is enshrined in the Declaration of Independence and not denied in the Constitution – but were subdued and defeated by the Army of the federal government in the Civil War does not mean that the states have surrendered any of their reserved powers to the government. The stigma of the Civil War cannot be used to propagate false constructions of the Constitution. The protection of liberty depends on the States acting in full exercise of their sovereignty (minus the limited powers delegated to the federal government) but also being mindful that they should do what they can to ensure the survival and integrity of the Union. States should not be legally bound to SERVE the federal government through such false constructions of the Constitution, which essentially is the position that the NCICL takes. Our government design was intended to be the other way around – the federal government was to serve the states. Per our charter of freedom, Jefferson’s Declaration of Independence , Liberty comes first. And the magical formula originally enshrined in the Constitution by our Founding Fathers was this: Limited Government = Maximum Liberty. And we also have to root out the mindset that states must surrender their sovereignty to the gradual and strained constructions of the Constitution which have happened over the years by liberal Supreme Court justices who have shown no conservative restraint in their interpretation of the Constitution. A contract, once signed, cannot be changed in material terms. And the material term at issue is the limited nature of federal power. 3). The Tenth Amendment. In its introduction, the NCICL claimed that nullification is based on the Tenth Amendment yet later in the article, it stated that “the Tenth Amendment does not authorize nullification.” I addressed the issue of authority above. It comes from the federal compact itself, founded on the law of compact. The principle of Federalism – or separation of powers — was incorporated into the Constitution through the Tenth Amendment. “The powers not delegated to the United States by the Constitution, nor prohibited by it to the States, are reserved to the States respectively, or to the people.” The Tenth Amendment is what makes the distinction between states’ rights and federal powers. With respect to the limited, enumerated powers that are granted to the federal government in the Constitution, the federal government is supreme (hence, it is sovereign). In all other areas of government, the States are considered supreme (they are sovereign). Hence, the concept of DUAL and COMPETING sovereigns. It is this division of power which keeps power centered where our Founders intended it to be… at least, that was the idea. Federalism is widely regarded as one of America’s most valuable contributions to political science. It is the constitutional division of powers between the national and state governments – one which provides the most powerful of all checks and balances on the government of the people. It is the foundation upon which our individual rights remain most firmly secured. The implication, of course, is that the States have to be vigilante and guard their sovereign rights and powers from a central government that will always seek to invade the domain of states’ rights in order to enlarge and concentrate its own powers. As history has always shown, governments have goals and objectives of their own, often in conflict with the rights of the States (and of the individual as well). To take it one step further, which both Thomas Jefferson and James Madison advocated, the states have an obligation – a duty – to stand up to any conduct on the part of the government which exceeds powers granted to it under the Constitution. Nullification, as explained above, is based primarily on the Supremacy Clause, but also on the Tenth Amendment. And yes, the Tenth Amendment does provide the basis for asserting a power that resides in the State and therefore not available for the federal government. If the power is therefore not available to the federal government, any law attempted to be passed pursuant to that power would be invalid, null, and void. Under the law of compact, the states would have the authority to call the federal government out on conduct that exceeds the authority granted in the compact document – the Constitution. Nullification would therefore be the proper remedy. 4). The Supreme Court. The final claim the NC Institute for Constitutional Law makes is that nullification lacks legitimacy because it has been rejected by the Supreme Court. First of all, would there even be any doubt that any branch of government would like to disavow nullification. It is a direct threat to their power and their authority. Hasn’t the Supreme Court become far more powerful than any of our Founders could have imagined? The position of our Founders can be summarized by two schools of thought. On one hand, Thomas Jefferson never trusted the federal courts, especially the Supreme Court. He never saw the wisdom in trusting six individuals (the make-up of the Court at the time). On the other hand, the drafters of the Constitution envisioned the judiciary as the weakest branch, not capable of much more than offering an opinion as to the constitutionality of the actions of the other branches. And in a letter penned 1823, he wrote: “At the establishment of our constitutions, the judiciary bodies were supposed to be the most helpless and harmless members of the government. Experience, however, soon showed in what way they were to become the most dangerous; that the insufficiency of the means provided for their removal gave them a freehold and irresponsibility in office; that their decisions, seeming to concern individual suitors only, pass silent and unheeded by the public at large; that these decisions, nevertheless, become law by precedent, sapping, by little and little, the foundations of the Constitution, and working its change by construction, before any one has perceived that that invisible and helpless worm has been busily employed in consuming its substance. In truth, man is not made to be trusted for life, if secured against all liability to account.” (Letter to Monsieur A. Coray, October 31, 1823). “Whoever attentively considers the different departments of power must perceive, that, in a government in which they are separated from each other, the judiciary, from the nature of its functions, will always be the least dangerous to the political rights of the Constitution; because it will be least in a capacity to annoy or injure them. The Executive not only dispenses the honors, but holds the sword of the community. The legislature not only commands the purse, but prescribes the rules by which the duties and rights of every citizen are to be regulated. The judiciary, on the contrary, has no influence over either the sword or the purse; no direction either of the strength or of the wealth of the society; and can take no active resolution whatever. It may truly be said to have neither FORCE nor WILL, but merely judgment; and must ultimately depend upon the aid of the executive arm even for the efficacy of its judgments. This simple view of the matter suggests several important consequences. It proves incontestably, that the judiciary is beyond comparison the weakest of the three departments of power; that it can never attack with success either of the other two; and that all possible care is requisite to enable it to defend itself against their attacks. It equally proves, that though individual oppression may now and then proceed from the courts of justice, the general liberty of the people can never be endangered from that quarter; I mean so long as the judiciary remains truly distinct from both the legislature and the Executive. For I agree, that “there is no liberty, if the power of judging be not separated from the legislative and executive powers.” And it proves, in the last place, that as liberty can have nothing to fear from the judiciary alone, but would have everything to fear from its union with either of the other departments; that as all the effects of such a union must ensue from a dependence of the former on the latter, notwithstanding a nominal and apparent separation; that as, from the natural feebleness of the judiciary, it is in continual jeopardy of being overpowered, awed, or influenced by its co-ordinate branches; and that as nothing can contribute so much to its firmness and independence as permanency in office, this quality may therefore be justly regarded as an indispensable ingredient in its constitution, and, in a great measure, as the citadel of the public justice and the public security. The NC Institute for Constitutional Law claims that “Nullification not only lacks any basis in the Constitution but also is directly contrary to the most basic principles of federal supremacy…” It claims that the Supremacy Clause settles the issue of nullification. This is simply a misguided interpretation and analysis of nullification. The NCICL might be apologists for the federal government or they might be supporters of the “Living Document” approach to constitutional interpretation so that they personally want to illegitimize this re-emerging remedy, but they simply cannot disregard nullification on the bases they provided. There should be no need for someone like me to articulate why nullification is indeed a legitimate concept and a legitimate exercise of state power to resist federal tyranny, or for anyone else for that matter. Our Founders did a far better job of that than I ever could. They did a better job than any of us could. Alexander Hamilton did a good job of it in the Federalist Papers. Thomas Jefferson did an excellent job in the Kentucky Resolves of 1798 and 1799. James Madison did a superb job in the Virginia Resolves of 1798. And John Calhoun did an outstanding job in his Fort Hill Address. Any of our Founders and any of these primary documents can be used to argue successfully against the NCICL’s position. I don’t know about anyone else, but when it comes to what our Constitution means and what our legal remedies are, I take my cue from Thomas Jefferson and James Madison and Alexander Hamilton, and not from a modern-day Supreme Court or self-serving branch of the federal government, or even a constitutional organization like the NCICL. The history of the federal government – all 3 branches – is a history of repeated attempts to enlarge and concentrate its power. Anybody who fundamentally understands the purpose and goals of the Constitution – to establish a LIMITED government of defined responsibilities that serves and unites the states but respects the bounds of sovereignty – knows that the Supremacy Clause does NOT give protection to EVERY action/law/policy of the federal government. Rather, the Supremacy Clause affirms the very nature of the Constitution – that when laws are made in pursuance of legitimate grants of power, they are supreme and to be treated as such by courts throughout the country. The reverse is therefore true. When laws are not made in pursuance of legitimate grants of power and are instead an exercise in abuse of power, then they are illegitimate and are null and void. I suppose the next article to come from the NCICL will assert that the Founders aren’t the real authorities to consult any longer for the meaning of the Constitution. While groups like the NCICL and even elected state officials denounce nullification as an illegitimate exercise of state power, you have to ask yourself one question: If this remedy is off the table, what are the meaningful options left to states who are frustrated in their attempts to stand up to growing federal tyranny? Do they take their chances with a rogue Supreme Court? Is that what our Founders had in mind by a “limited” government that “serves” the states and respects their sovereignty and sovereign concerns? I don’t think so. The government can push its position that nullification lacks legitimacy because the Supreme Court says so (or alludes to it). Supporters of big government can continue to associate nullification wrongly and deceptively with slavery and the perpetration of Jim Crow. And state representatives can refuse to support it, thereby killing the spirit that once refused to ratify the Constitution until it incorporated the Tenth Amendment so that states’ rights would remain strong and relevant. But what if Nullification is the best shot we have of restoring our republic? Would we be willing to take another look at this remedy that Thomas Jefferson articulate for us? After all, our distinct group of Founders, so educated in government theory and so inspired to secure the liberty won by the states in the Revolutionary War, would have left us a way to preserve that liberty so that the combined history of England and America in advancing the rights of men with respect to government would not be sacrificed. That safeguard is the combination of federalism and nullification. There will be opponents that will never see the wisdom in this most important of checks and balances. But that’s because so far we’ve been insulated from the kind of evil that the rest of the world has suffered. Imagine that sometime in the near future, because the world has become an ever-increasing scary place, on the verge of war and great economy stress, and because Americans want security more than freedom, we happen to elect a charismatic president who makes a lot of promises. That President is Adolf Hitler. What would you hope would happen in this country. How would you hope your system of government would operate? Would you hope that the states blindly follow whatever policies this President Hitler puts in place? What if he did here what he did in Germany and passed the Enabling Act, which suspended the peoples’ rights of speech, press, and assembly? What if he nationalized the church? What if he enacted a policy of stripping certain citizens of their property and citizenship? And what if he then proceeded to round us up and put us in detention or death camps…. because after all, at that point we wouldn’t be entitled to any rights that the laws protect. Would you want your state officials to say: “It’s not our job to second guess President Hitler and the federal government?” Or would you hope and pray that your state would stand up, assert its sovereignty, protect you and fellow citizens from harm, and refuse to enforce Hitler’s policies in your state? That’s the worst-case scenario, I know. But it makes you think about the importance of all the checks and balances that we have in our American system. Let’s not take any for granted, and especially let’s not call into question the legitimacy of a safeguard like Nullification/Interposition by placing more emphasis on the federal government’s position over the Founders’. Our greatest Founding Father left us with this advice: “The ground of liberty is to be gained by inches; we must be contented to secure what we can get from time to time, and eternally press forward for what is yet to get.” No matter how much liberty we have lost, no matter how serious our constitutional crisis is, or how oppressive government has become, it is still possible to “press forward.” But we need his remedies. If lovers of liberty are persistent enough, Jefferson’s principles will prevail and we will once again have the freedom which he helped our ancestors to secure. Thomas Woods, Nullification: How to Resist Federal Tyranny in the 21st Century; Regnery Publishers, 2010.